Should I Rent a Boat in the Hamptons? Exploring the Hamptons by boat is a wonderful experience that escapes many visitors coming to Sag Harbor, Southampton and the surrounding area. With Peconic Water Sports new boat rental program you can get in on the fun and explore Peconic Bay and avoid the ferry’s and long car journeys you would need to take to visit nearby Shelter Island and places like Greenport on the North Fork. Aside from enjoying a nice day out on the water with friends or family, there are many stops you can take around the bay. When you leave our location at Mill Creek Marina in Noyac Bay, you will be presented with an expansive body of water with many activities and places to visit. 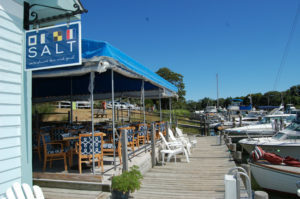 You can cruise over to West Neck Harbor and visit amazing dock side restaurants and bars like Salt. 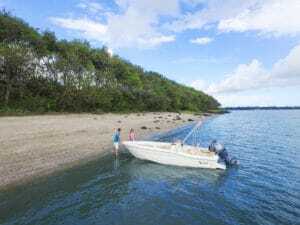 Alternatively head to Deering Harbor on the north side on the island and go enjoy a nice walk around the island or a quick coffee and delicious french pastries at Marie Eiffel Cafe. Greenport is you next closest destination where you can find a plethora of restaurants, shops and plenty more things to discover whilst you walk off that delicious lunch. 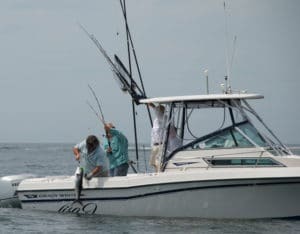 When you hit the water again, you can cruise around the many coves in the area and find some flat water to have a blast doing some water sports, swimming, or choose one of the many fishing locations where you can be sure catch, from porgies that the kids love to catch to serious size blue fish and sea bass. This all sounds like a lot of fun to pack into a day, so maybe you need to go home and enjoy a nice evening and just come back the next day and do it all again, there is so much to see and discover that we are certain this will become your go to activity when you visit the Hamptons and surrounding areas. Welcome to the Peconic Water Sports Blog! Check back often for pictures and videos of our adventures, tips and tricks for mastering your favorite water sports, and more!